During WW1 Featherston was the location of what was New Zealand's largest military camp. Featherston Military Camp played a hugely important part in New Zealand's war effort during WW1 by training and preparing around 60,000 Kiwis-roughly two thirds of New Zealand's total troop contribution- before they embarked for service in the Middle East and western Europe. 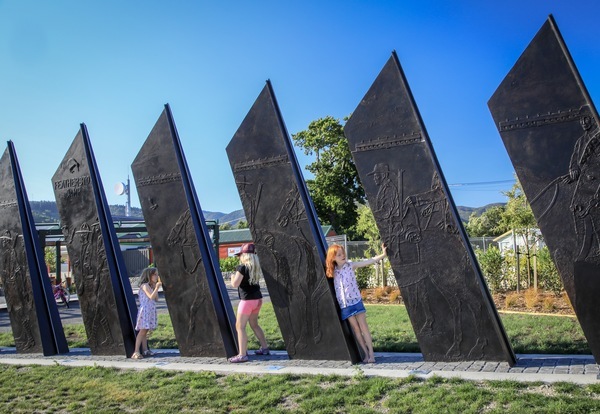 The Featherston Camp Sculpture was created by prominent New Zealand sculptor Paul Dibble. It connects us as we remember the 60,000 Kiwis and it highlights the significance of the Camp. Stop, and get up close to the pillars which show soldiers and their horses marching towards the hills against a background of the Army Camp buildings. The sculpture is right on the Main St.
With such an interesting miliatry history it's no surprise that one of Featherston's book stores specialises in books on miliatry history. Check our Messines Bookshop. Explore the town and stay for a bit -book your accommodation here.